CRIMINAL charges may be laid against those involved in an ugly brawl following an Anzac Day Rockhampton A-grade rugby union match between Brothers and Colts. As players were shaking hands after the game finished on Saturday afternoon they began throwing punches. One player appeared to get his head stomped. 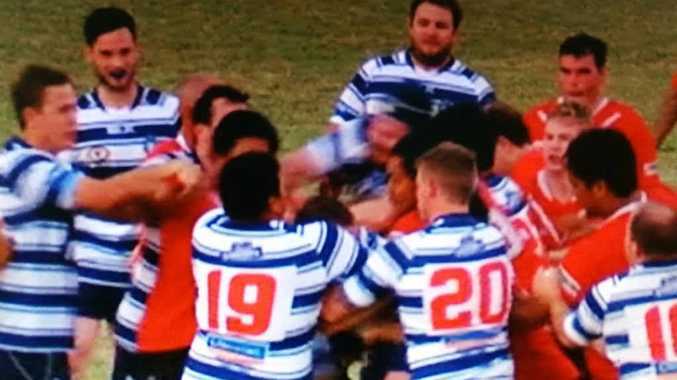 Central Queensland Rugby Union president Ian Coombe was at the game and witnessed the incident. He said it was extremely disappointing, especially on Anzac Day. "It was the most shocking incident I've ever seen in the years that I've been involved," Mr Coombe said. "From my perspective it has no place in rugby union, or in any sport. "To say that I am disgusted would be an understatement." He said punishments, in the form of suspensions, would be handed down from the CQRU to players involved. Colts' President Jeff Ballinger said they were very disappointed in the players' behaviour, and the players were disappointed in themselves. "It ruined a very good game of football," he said. "We're working closely with the CQRU to make sure everyone involved is dealt with appropriately. "It's up to the police to make their own assessment of the situation." Yesterday afternoon the committee and players had a meeting to discuss the incident, and Mr Ballinger said the players described it as a disagreement that got out of hand and became very ugly. The CQRU will review footage today to try and identify players involved, and those players will be called for a judicial hearing. But that could be the least of their worries, with Rockhampton CIB Detective Sergeant Nick Williams confirming a complaint had been made and police were reviewing footage of the brawl provided by Channel 7. Det Sgt Williams said detectives were taking statements from all the witnesses. He said there was the possibility of assault occasioning bodily harm charges being laid. Once all statements have been taken a decision will be made about whether anyone will be charged. "I understand some other people may have taken footage on their mobile phones and we are asking they contact police," he said. Tonight the CQRU committee is holding a special meeting. Brothers' representatives declined to comment.